So far on PintLog, I've tried three beers from the Victory Brewing Company out of Pennsylvania, and I've given them all grades in the "A" range. This makes Victory one of the highest rated breweries on the site, and puts a little pressure on Prima Pils, the next Victory brew up for review. Heaps of hops give this pale lager a bracing, herbal bite over layers of soft and smooth malt flavor. This refreshing combination of tastes makes Prima a classy quencher in the tradition of the great pilsners of Europe. Dry and delightful, this is an elegant beer. Will Prima Pils be the fourth Victory brew in a row with an "A" on it's report card? Let's pop it open and see. Appearance: Exceedingly pale lemony-yellow, hazy body under a generous white head that leaves gorgeous clumpy lacing. A rather pretty presentation. Aroma: Lemony and earthy hops over a honey malt base. A unique and intriguing profile. Taste: Crisp lemony hops in charge, with plenty of honey malt in the base. Not particularly bitter, but grassy and slightly minty at times. Well balanced. Mouthfeel: Medium-light body with crisp carbonation. Dries a little in the finish. Drinkability: Nice and refreshing, this goes back rather quickly. 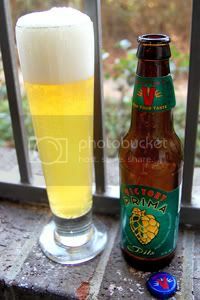 Verdict: Prima Pils is a very solid Pilsener and another very solid offering from Victory. Rather unique and quite sessionable, this is well worth a try if you're in the mood for something light. Victory is one of those breweries who can brew great beers from all parts of the spectrum, from this pale Pilsener to Storm King, their Russian Imperial Stout.